"I was happier when I wasn't president." Los Angeles Lakers President of Basketball Operations and Hall of Fame player, Magic Johnson, announces his resignation before the team's final game of the season. Earvin "Magic" Johnson dropped a bombshell on Tuesday night ahead of the Los Angeles Lakers' final game of the 2018-19 season when he suddenly announced that he's stepping down as President of Basketball Operations for the Los Angeles Lakers, multiple outlets reported. 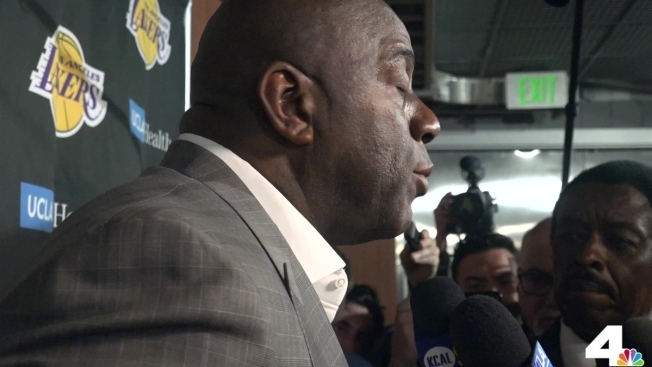 "Today, I'm going to step down as the president," Johnson told a stunned crowd of reporters gathered outside the Lakers' locker room. After saying "I'm free" at one point, Johnson added, "I feel like a monkey has been lifted off my back." The 59-year-old held nearly an hourlong impromptu press conference where he told reporters that Jeanie Buss, the Lakers' owner, had not been informed of his decision. "She doesn't know that I'm standing here, because I would be crying like a baby in front of her, even though I'm about to cry right now," a visibly emotional Johnson said. Johnson, who took over as Lakers president of basketball operations in February of 2017, shared that he felt restrained by his position, citing his desire to be present for Miami Heat guard Dwyane Wade's final game, help mentor tennis player Serena Williams, assist in developing Philadelphia 76ers guard Ben Simmons and share public support for Russell Westbrook achieving a historic with a 20-rebound, 21-assist, 20-point game. "I had more fun on the other side," Johnson said. The man who won five NBA titles as a player shared frustrations regarding multiple tampering investigations by the league office and his inability to mentor young men outside the organization. Johnson said, "I was like, 'I have a great life outside of this. What am I doing?' So, I'm going to go back to that beautiful life. And I'm looking forward to it." He added, "I was happier when I wasn't president." When asked about his message to the fans, Johnson said, "We're heading in the right direction. Just hang in there. Everything's OK."
Later, Buss took to social media and tweeted, "Earvin, I loved working side by side with you. You've brought us a long way. We will continue the journey. We love you." "There is no greater Los Angeles Laker than Earvin Johnson," the Lakers said in a statement. "We are deeply grateful to Magic for all that he has done for our franchise – as a player, an ambassador and an executive." Johnson's greatest achievement as an executive would undoubtedly be bringing LeBron James to Los Angeles on a four-year contract. During his tenure as head of Lakers basketball operations, Johnson oversaw a major overhaul of the roster. Brandon Ingram is the only player on the current roster that was on the team when Johnson took over. After he completed the press conference, Johnson proceeded to give hugs to media members present, adding with his trademark smile, "This is it for me."